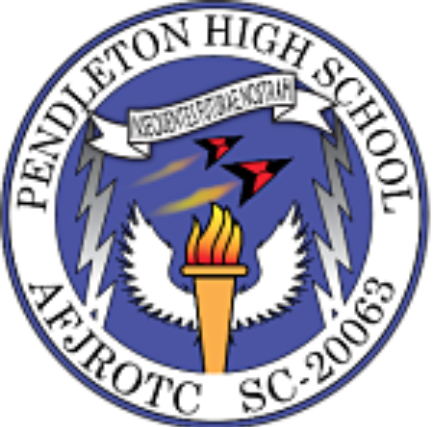 The Pendleton Air Force JROTC program provides a diverse and challenging curriculum. The AFJROTC instructors have over 40 years of combined military experience to include tours all around the world and the continental United States. They are dedicated to providing a course designed to encourage personal growth, responsibility, and leadership. Participate in JROTC Clubs to include Rocketry and Aircraft Modeling. Join the Marksmanship, Academic Bowl, and Drill Teams and compete against other schools. Attend field trips to military bases, air shows, aviation industry, and leadership events. Accept membership into the Kitty Hawk Honor Society. Cadets desiring to advance in rank and assume increased leadership responsibility must be involved in community service and school activities. By law, cadets are required to wear the Air Force uniform once a week. Uniform issue is free of charge but each student is responsible for the maintenance and security of their uniform. There is a $30.00 fee to cover uniform maintenance and other miscellaneous program costs. This fee is reduced or waived based on financial need. NOTE: Students may not have visible pierced body parts (nose, tongue, eyelid, lip, etc.) while in uniform. Female cadets are allowed to wear one pair of conservative earrings while in uniform. THERE IS NO OBLIGATION TO THE AIR FORCE OR ANY BRANCH OF THE MILITARY BY TAKING AFJROTC. HONOR CODE "We Will Not Lie, Steal, Or Cheat, Nor Tolerate Among Us Anyone Who Does." We expect all cadets in the cadet corps to adhere to the honor code and core values, and display appropriate behavior at all times. AFJROTC MISSION Develop citizens of character dedicated to serving their nation and community.